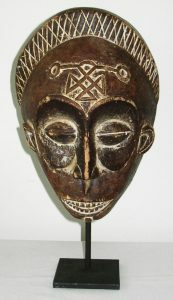 African ceremonial mask, probably from Zaire. 1st half 20th C. 15″ high, 8 1/2″ wide. 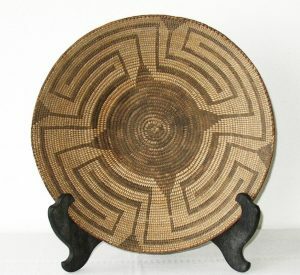 Pima Indian basket, 15″ across, 3 1/4″ high. Early 20th C., very good condition. 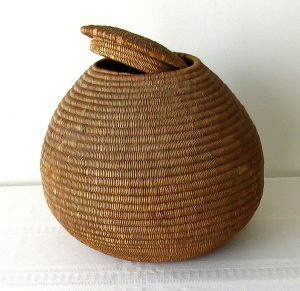 Inuit round covered basket in excellent condition. First half 20th C. 9.5″ tall, 34.5″ circumference. Alaskan origin. 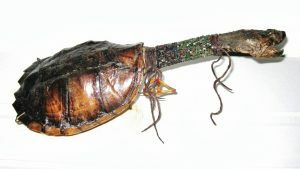 Eastern Native American Snapping Turtle ceremonial rattle with its original Trade Bead wrapping and leather drops. Probably Iroquois Nation, 2nd Q 20th C. Very good original condition with 3 small holes in the very outer shell (the inner shell is all intact. The sinew sewn underside is all intact as well. 16 1/4″ long overall. From an Arkansas collection. 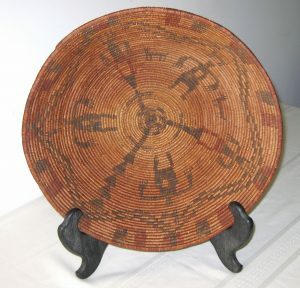 Exceptional Apache polychrome (black and red) woven basket depicting 5 human figures and 5 animals along with other design elements. Some minot variations from age and use. 14 1/2″ diameter, 3 3/4″ high. Good quality tight weave and rim wrapping. Extra large Northeastern Indian carved and paint decorated war club. Exceptionally well carved and painted in excellet condition. A few minor root tip losses on back of the club head. 26″ long, 9 1/2″ across root head. circa 2nd 1/4 1900’s. More detailed photos available. 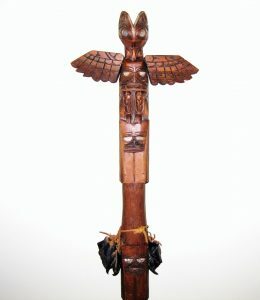 Large carved Northwest Coast Native American Speaker’s Staff from the mid 20th C. Very well carved with a4 large iconic figures. Accented with abalone eyes and dear feet. The main staffis in excellent original condition. The 2 wings are restorations, From a Washington State collection, Overall length is 60 1/2″.